We’d love your help. Let us know what’s wrong with this preview of Unexpected Blessings by Roxanne Black. When Roxanne Black was only fifteen years old, she was diagnosed with lupus, a chronic inflammatory disease that can attack the vital organs of the body. As a teenager with a frightening and sometimes life-threatening disease, she yearned to connect with others who knew firsthand what she was experiencing. So she started a support group from her hospital room to bring pati When Roxanne Black was only fifteen years old, she was diagnosed with lupus, a chronic inflammatory disease that can attack the vital organs of the body. As a teenager with a frightening and sometimes life-threatening disease, she yearned to connect with others who knew firsthand what she was experiencing. So she started a support group from her hospital room to bring patients together. That group now has become Friends’ Health Connection, a nationwide community that matches people with similar conditions, from cancer and lupus to paralysis and chronic pain and more. Along the way, Roxanne Black has inspired millions. Roxanne’s mission each day for the last twenty years has been to turn her “bad news” diagnosis into something positive. 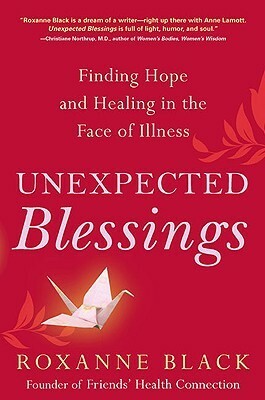 As she says, “When I might wonder ‘Why me?,’ I know the answer: ‘To help others.’” Unexpected Blessings is an extension of that goal, bringing to life not only Black’s moving personal story but also the lessons of courage she’s learned from all the famous and not-so-famous people she’s met over the years. From a poignant encounter with Christopher Reeve to her intimate experiences with patients around the globe standing strong in the face of extraordinary challenges, these are stories of heroism and hope. They are also reminders of the healing that comes when we can connect from the heart. To ask other readers questions about Unexpected Blessings, please sign up. I received this book as a Goodreads giveaway early this year. There could not have been a more perfect match in a book giveaway at the time since I'd been feeling rather defeated by my own health puzzle and the medical bureacracy maze. Immediately I found solace and a friend in the author's words, so much so that I had read over half of it right away. I did not want the journey to end - so in a very contradictory move - I put the book aside to savor at a later time. Just the other day I picked u I received this book as a Goodreads giveaway early this year. There could not have been a more perfect match in a book giveaway at the time since I'd been feeling rather defeated by my own health puzzle and the medical bureacracy maze. Immediately I found solace and a friend in the author's words, so much so that I had read over half of it right away. I did not want the journey to end - so in a very contradictory move - I put the book aside to savor at a later time. 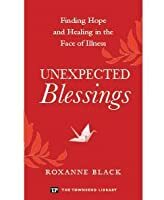 Just the other day I picked up where I'd left my compassionate friend I made in Roxanne Black's memoir "Unexpected Blessings: Finding Hope and Healing in the Face of Illness". Roxanne's story is captivating and her writing talent is deeply heartfelt. One cannot help but empathize with her own health plight on the roller-coaster ride of being a two-time kidney transplant recipient and navigating life with a chronic auto-immune disease. The first part of this book demonstrates her individual challenge simply in getting an accurate diagnosis and treatment plan, which I fully relate to. Throughout her journey she befriended many leading edge healing practitioners, including meeting Dr. Oz before his Oprah days. What kept her going through her own urgent health crisis was the formation of her non-profit organization Friends Health Connection. Friends has received ample support within the healing community and national media coverage. In the back of her book are healing resources with many previously unknown to me. I feel I am ready now to begin to utilize her resources and link up with others to share my story with theirs in an exchange of dialogue. Gaining access to broader information in community beyond simply going it alone, but to truly give back from an authentic heartplace as Roxanne portrays, is all anyone can ask. This is an eloquently written and inspiring book. It's honest, open, very human and even humorous at times. I found it uplifting and valuable to be immersed in Roxanne Black's wealth of experience and intimate knowledge of the process of finding hope and healing in the face of illness. Though having to endure much suffering, Roxanne leant how to deal with it by devoting her life to helping others. She founded something called "Friends' Health Connection", through which she helped to connect other seriously ill, lonely and isolated persons by pairing them with other persons suffering from the same disease, or who were in a similar situation. Roxanne hereby brought much comfort and companionship to others. This book, apart from being extremely well-written, is wonderfully inspiring and heart-warming. As well as telling us about her upbringing in her loving and supportive family, and her various trials and tribulations, she communicates to us her positive view of life. She shows us how she was able to transform extremely difficult life circumstances to opportunities to help thousands of others, thereby creating an absolutely meaningful life for herself. She describes the inspiration she herself received from how Christopher Reeve, though paralysed from the neck down, tackled his predicament. I would recommend this book especially to those in difficult situations who need inspiration and encouragement. It helps the readers to realize that their own situation is not that bad and that they too have the option of helping themselves by helping others. I really enjoyed this book -- it was not only inspirational, but also renewed my hope. It featured stories from the author's life, as well as her interactions with other patients. There are patients the author met in the hospital as well as people like Christopher Reeve and Deepak Chopra. It was an encouraging read, moving quickly from story to story; I didn't want it to end. One book I will definitely be rereading. The book was a really good read. Talks not only about herself but yet others that she has met over her years of being in treatment. The ups and downs of everyday living. The funny stories and then, not so funny stories. How Roxanne's mother was her "ROCK"! Now she has her own family, whom she is their "ROCK". I really enjoyed this book. She's a great writer and her story is engaging. Struggling with a long-term, chronic illness, she manages to maintain a wonderful attitude. A great read for anyone dealing with chronic illness. Wow, maybe this book came at the right time in my life, but holy cow it touched me in such an intense way. Beautiful stories of kindness and appreciation of life that we can all use. Healthy or not, it is a book for all. A memoir by a brave, wise, and lovely young woman it has been my good fortune to know.